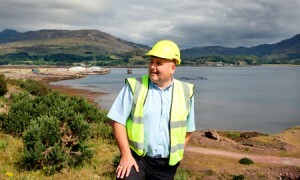 Plans to breathe new life into the former oil fabrication yard at Kishorn in Wester Ross are to be boosted by a £500,000 investment. Kishorn Port Limited, the joint venture seeking to resurrect the yard, has begun the first phase of re-instating the site’s dry dock. Kishorn has recently been identified as an area which could play a key role in the decommissioning of North Sea oil rigs. With support of Highlands and Islands Enterprise, a contract has now been issued to Welsh marine engineering company Harris Pye to trial the dock gates, which were last opened when the Skye Bridge caissons were constructed there in 1993. 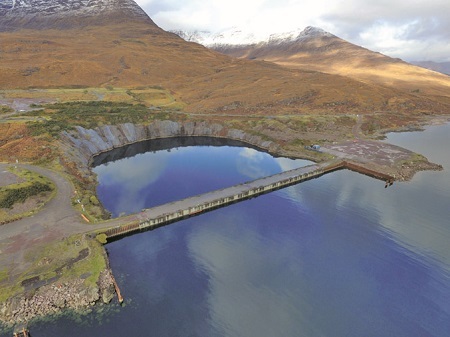 Kishorn Port Ltd, a joint venture between Ferguson Transport and Shipping and Leiths (Scotland) Ltd, has been working over the last eight years to identify markets that need access to sheltered deep water and a large dry dock. The projected cost of decommissioning the North Sea oil and gas infrastructure has been estimated at £75 billion and continues to grow. To date, most of the large contracts have gone to yards elsewhere in Europe or Scandinavia, mainly because there is a shortage of adequate licenced facilities in Scotland.